I’ve made brioche before, and I’ve made cinnamon rolls before. 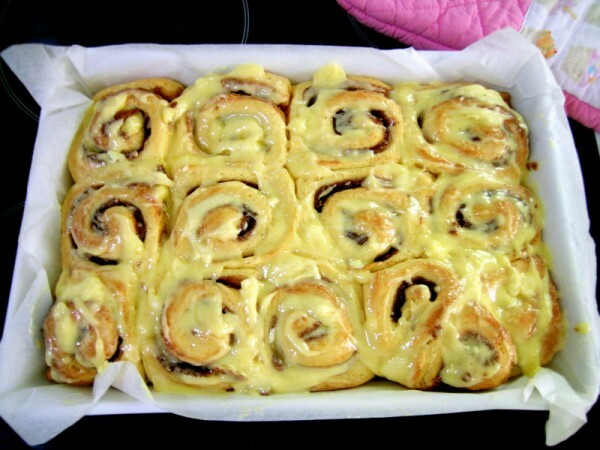 But I’ve never made brioche cinnamon rolls. I’m so proud of myself for this one – I did a really fantastic job on these. I first made brioche a month or so ago, from this very easy recipe at Almost Bourdain. It was a breeze to make and when it was done, I was rewarded with this beautiful loaf of brioche. I mainly used it for French toast! But it made me wonder what else I could with it, and cinnamon rolls popped into my head. I recalled the previous cinnamon rolls I had made, which were the first ones I had made with yeast (last year I had posted a cinnamon roll recipe that did not require yeast) about 4 months ago. 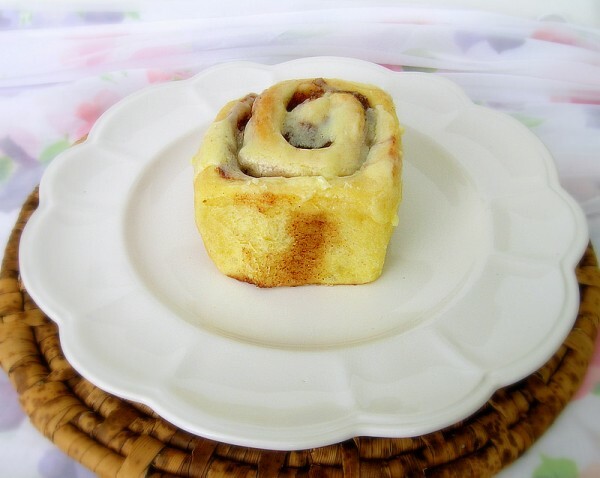 It was a copycat Cinnabon recipe. They tasted delicious, but they didn’t last long enough to photograph! My plan was to make the brioche dough for cinnamon rolls, and use the filling (a mix of brown sugar and cinnamon) and icing (a cream cheese glaze) from the copycat Cinnabon recipe. I was pretty much just winging it, as I wasn’t sure how thick I should roll the dough out to, or if I should cut the filling recipe in half. I even had no idea how many rolls the dough would make! I made the brioche recipe from Almost Bourdain up to the point where I had finished kneading the dough by hand. I then used my rolling pin to roll it out into a rectangle shape, I’d say it was about 1/3″ thick? When I was done rolling it, I spread some slightly cooled, melted butter on top of the dough and sprinkled the full recipe for the Cinnabon filling (1 cup packed brown sugar + 2 1/2 tablespoons cinnamon, mix well) evenly on top of the butter. I went over the filling with the rolling pin to make sure it was packed on well. Starting from the longest side of the rectangle, I rolled up the dough tightly (but not too tightly). I cut each roll about 1/3″ – 1/2″ thick, or somewhere around there. Be careful when cutting the rolls as you don’t want to flatten the roll. Use a warm damp sharp knife (dip the knife into a bowl of warm water, or hold it under warm water from the faucet) and dab it onto a towel to dry off excess water. Then using a wide sawing motion, and gently holding one side of the roll, cut one slice. You’ll need to repeat that process with each slice, being sure to wipe off any dough and cinnamon on the knife before proceeding. I ended up with 14 rolls – I had 3 small ones from the ends of the roll, so I scrunched them up in a corner of the baking pan. After placing the rolls in the pan (I put a layer of baking paper on the bottom of the pan), they’ll need to be left in a warm place again to rise until doubled in size. This took about an hour for me. While the rolls are baking, you should prepare the cream cheese glaze. I did cut this recipe in half, because when I made it before I thought that it was way too much icing. Also, I wanted to be sure to be able to taste the brioche. The cream cheese glaze recipe is – 4 tablespoons softened unsalted butter, 3/4 cups sifted confectioners’ sugar, 2 tablespoons (or 1 ounce) softened cream cheese, 1/4 teaspoon pure vanilla extract and a pinch of salt. Place all the ingredients into a bowl and use an electric mixer to mix until fluffy. As soon as the rolls came out of the oven, I put a dollop on top of each roll, let it melt for a minute, then spread the dollops over the rolls with an offset spatula. How indulgently delicious does that look! I tried one straight after icing and it tasted incredible, I was so pleased! I even took some to our neighbors across the road, which they enjoyed for afternoon tea. I stored the rest in the refrigerator (because of the cream cheese) and when we wanted to have one, we reheated it in the microwave for about 15-20 seconds. They definitely tasted better straight out of the oven, however. 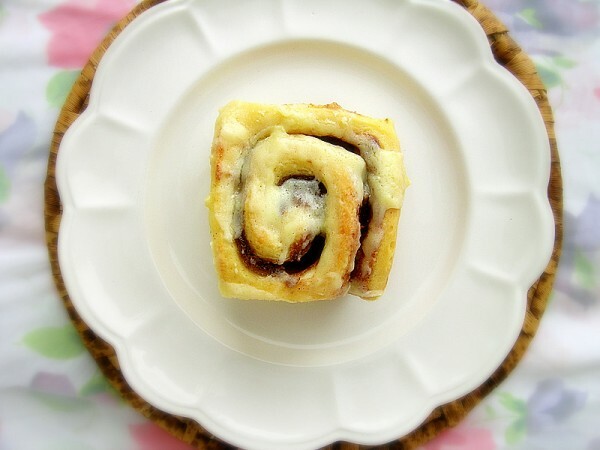 It’s kind of funny that after I made these cinnamon rolls last week, I suddenly started seeing a lot of other food blogs baking cinnamon rolls. It must just be the season! Here’s the copycat Cinnabon cinnamon rolls, from Pass The Sushi; bacon cinnamon rolls from Framed Cooks; caramel apple cinnamon rolls from Annie’s Eats; and pumpkin cinnamon rolls from Naturally Ella. Looks like everyone loves cinnamon rolls! 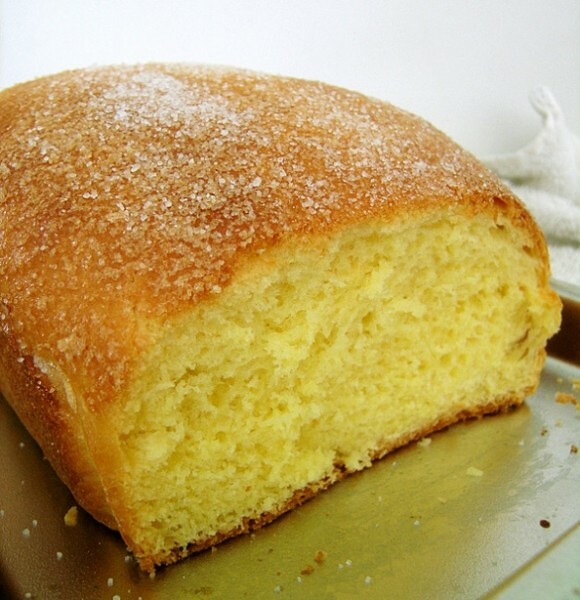 I’ve never made brioche before and I shall strive to attempt that before I even dream of attempting this…! These look incredible and a variation I would so try! Thanks a lot! That looks so good. I love cinnamon rolls. I love a good brioche and baking it into cinnamon rolls seems like a natural rejoinder to its buttery beauty. It’s been too long since I’ve commented on your blog and this is the perfect recipe to get me to delurk. I agree that brioche is a good base for just about anything! I too love it in french toast and it’s heavenly in bread pudding. I’ve tried it in caramel rolls, but never cinnamon so this now makes me think I should give it a go. My foray into baking brioche was a disaster! You had much more success than me, and these cinnamon rolls look fabulous. I recently ate brioche for the first time (in the form of twice-baked brioche–to die for!) 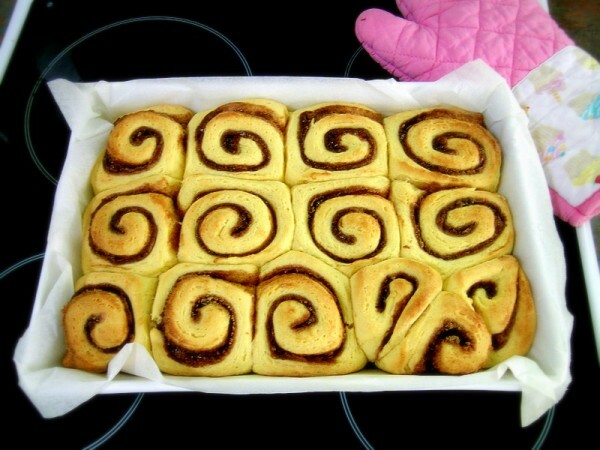 and now I’m wanting to make it…these cinnamon rolls look incredible! Great job! OMG. I absolutely love brioche, and I love cinnamon rolls! I didn’t know how much I was obsessed with brioche until I moved here to France… Let’s just say a loaf doesn’t last longer that 48 hours here. haha!